Very nice, Tom. Is it for a comic book or for some kind of animated feature? Or perhaps even a comic strip? Hope it’s all three. Best wishes. I’m really glad you like it. This is a totally new thing for me. For now it’s an epic ongoing comic, but I’m looking to expand this in every imaginable direction. Great to see you getting your work out there online Tom — it has been frustrating finding (and affording Mo8O). Any chance of you putting completed “issues” or stories on the ipad/iphone? Also, have you looked at all into the commenting system Disqus? It’s free and really easy to set up; it allows you to be notified of people responding to a thread you have posted on and also makes it really to cross promte entries onto services like Twitter and Facebook. It’s really cool and I think it would add to this site and the Mo8O online comic. How’d I not know about a Tom Scioli comic book I could read online before most anybody else?!! I’ve been livin’ in a fool’s paradise! This is great! Hope to see it in print one day soon. I’m a latecomer to this comic, but I love it! It bristles with energy, thanks to both the art and the raw language. The story was a blast. Thanks so much for doing it! Kirby would be proud. After a great run on Godland, I was jonesing for some Scioli goodness. 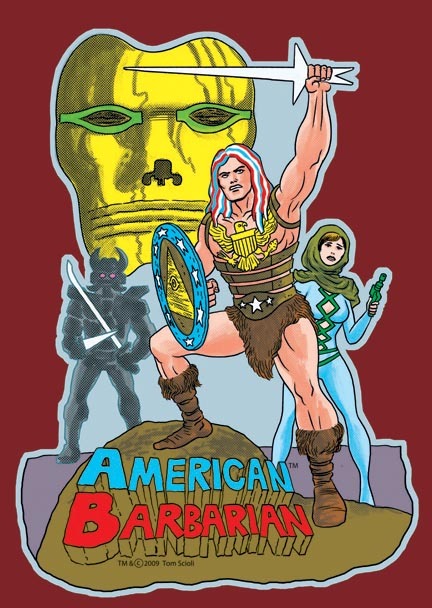 Thank God for American Barbarian! The frenetic Kirbyesque psychedelic colors and bold linework speak volumes of its vim and vigor. The new school story twisted up in an old school skin and theme are really a pleasure to behold. Great stuff man…the next ish can’t come soon enough!